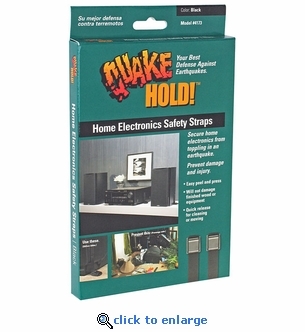 Quake Hold Home Electronic Safety Strips use a two-point fastening system to secure your electronic equipment in the event of an earthquake. Use for VCRs, DVDs, satellite receivers and more. Slide the 11" adjustable straps into the quick release buckles, peel the adhesive from the buckles, press into position and your done. The buckles remove easily without damage to your equipment or furniture. Can also secure small fish tanks, kitchen appliances and portable TVs. 2 - Buckles with 3M Adhesive. 2 - 11" straps with Velcro hook and loop fasteners.